The dollar bulls are making a comeback. 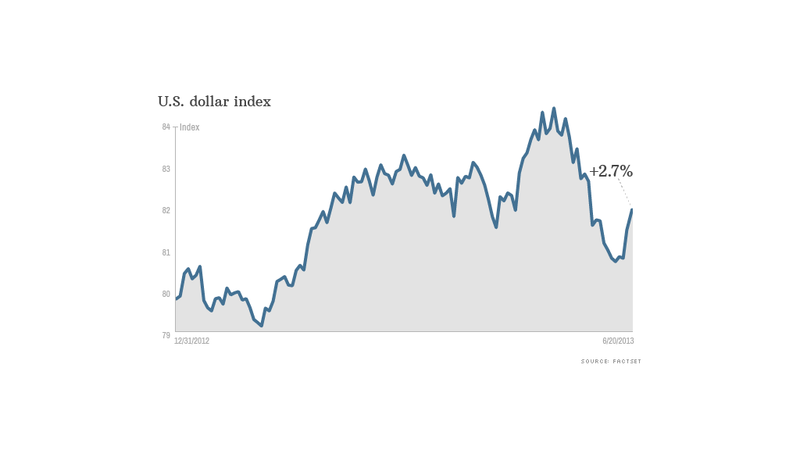 Investors are becoming increasingly bullish about the U.S. dollar in anticipation of a stronger economy later this year. The newfound enthusiasm for the buck follows a choppy period as investors prepare for the Federal Reserve to eventually unwind its stimulus program. 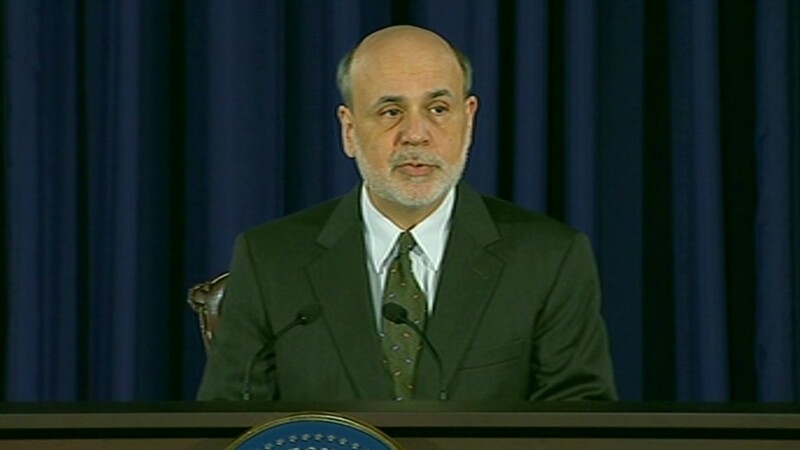 Depending on how the economy performs, Fed chairman Ben Bernanke said Wednesday that the central bank could begin tapering its bond buying program by the end of this year. The remarks sent the dollar higher against its main trading partners as stocks fell and bond yields rose. "The dollar is the king of castle, extending yesterday's post-Fed rally across the board," said Marc Chandler, head currency strategist at Brown Brothers Harriman. Although the Fed trimmed its outlook for economic growth this year, traders seemed to take Bernanke's comments as confirmation that the recovery is gaining momentum. At the same time, market volatility is expected to remain high for now, which should help boost the dollar. The CBOE Market Volatility Index (VIX) spiked 10% Thursday. The big picture. Beyond the immediate Fed driven moves, many investors say the dollar will push higher as the economy continues to strengthen. "The factors are coming together for a mutli-year rally in the dollar," said Paresh Upadhyaya, senior currency strategist at Pioneer Investments. For one, the U.S. economy is expected to grow faster than most developed economies in the world, said Upadhyaya. In addition, the U.S. government appears to be getting its fiscal house in order sooner than anticipated, thanks largely to forced budget cuts that took effect earlier this year. The federal deficit is expected to fall to 4% this fiscal year, and drop to 3% by 2019, according to the Congressional Budget Office. That's substantially lower than the CBO had predicted in February. And the boom in domestic energy production could reduce the nation's trade deficit and external financing needs. "The energy independence story is a very big story as far as dollar is concerned," said David Woo, head of global rates and currency research at BofA Merrill Lynch. The volatility factor. In the sort-term, the dollar could benefit from its reputation as a safe haven as concerns about the Fed keep investors on edge, according to analysts at Societe Generale. "The combination of stronger data, Fed exit fears and shaky risk conditions should prove positive for the U.S. dollar this summer," the analysts said in a recent report. The analysts said investors should look past the recent pullback, which was driven largely by investors unwinding positions in emerging markets following a rise in interest rates. Even with that retreat, the dollar is the third-strongest currency so far this year, according to SocGen. The euro has been number one, followed by the Mexican peso. Carry trade? Eventually the rise in U.S. interest rates should give the dollar an advantage over currencies in countries that have lower rates as investors execute so-called carry trades, which use the currency of a country with exceptionally low rates to buy higher yielding assets. The trade allows investors to earn interest while potentially making a profit on riskier bets. But it only works if investors are upbeat about the prospects for a global economic recovery. Jens Nordvig, head fixed income and currency strategist at Nomura, said interest rates are still too volatile to make this trade safe. He said rates should stabilize over the next few months as the shock of a potential exit by the Fed filters through the financial system. "That will be the time to get aggressive."